The Dual Relay Board is an accessory to the PhidgetInterfaceKit 8/8/8. Each relay can be controlled by a separate Digital Output and can control open or close a circuit up to 240VAC at 5Amps. 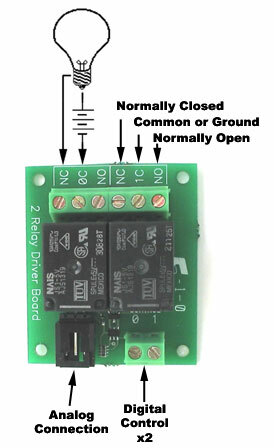 The relay board uses 1 analog input jack for it's power connection. Download the Dual Relay spec sheet! Do you have questions, comments, or concerns? Do you have a project you want to show off? The Trossen Robotics Community wants to hear from you!